Here at Airedale Springs, we really love our springs! Although, you’ve probably already guessed that. We have been manufacturing extremely high quality springs, pressings, and wire forms for over 70 years, and we love to experiment with new technologies and techniques. In the last few months, we have been talking about various types of springs and how they are used within society. Firstly, we talked about wooden springs, and, a few weeks ago, we discussed plastic springs, why they are used, and how manufacturing them differs from standard wire springs. Next on the list is complex springs; what are complex springs, what are they made of, how are they used in the manufacturing industry, and what makes them so good at what they do? These types of springs can be either complex in shape, or in composition. When it comes to shape, complex springs can be anything from unique pressings and wire forms or a combination of multiple springs in one structure; one common example is the Airedale Prison Spring, which consists of two “U-shaped” wire forms and a compression spring. This spring is used throughout various HM Prisons in the UK and it is tailored to be used to hold safety between landings in prisons. 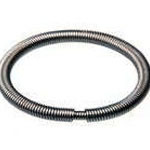 Another structurally complex spring is the garter spring, which is an extension spring that has its ends connected to form a circle, which provides a large amount of radial force. Complex springs can also be springs that have a different composition compared to traditional carbon steel springs. For example, some springs can contain nickel, others can contain chromium, etc. However, the addition of these elements can have some noticeable effects on the spring itself. One popular metal that is added to traditional springs is nickel. Nickel is a transition metal that has one important property; it is corrosion resistant. This means that when present in water or air, it will retain is chemical structure and not oxidise. This is important in harsh weather conditions or in applications where these springs are exposed. Another important characteristic for certain springs to have is a high melting point. One example of this is a filament within a light bulb. This isn’t exactly a spring, but it is made to look like a spring – a type of wire form. One thing that a filament needs to have is a high melting point, so these filaments are traditionally made of an incredibly heat resistant substance, such as tungsten. Complex springs are used in a multitude of industries, as they have certain traits and characteristics that would be beneficial for them, rather than traditional carbon steel, to be used. Various metallic alloys are better than carbon-based ones, as they can withstand greater temperatures. Complex spring structures are also used in various industries, as discussed with the Airedale Prison Spring. The reason they are so special is because you can link the constraints of one type of spring with the benefits of another, and the final solution is the perfect amalgamation of the two traits. All types of metallic springs are important to us, and we know how important they are to all our clients. As specialist spring manufacturers, we test every single spring that we design to ensure that they are fully capable of tackling the project in question, no matter if they are complex, compression or torsion, for example. If you want to know more about the springs we can provide for you, then please contact us today on 01535 643456 and one of our spring specialists will be more than happy to help.